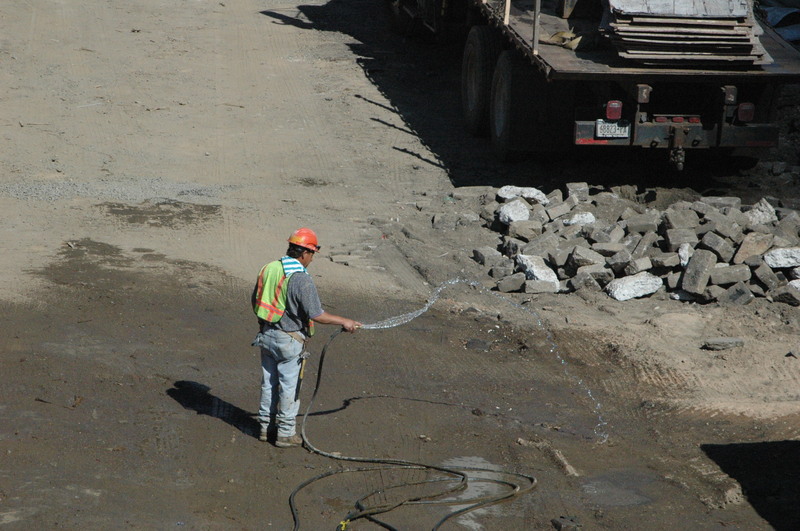 Watering the Dirt at Union Square Park Construction Site — All in a Day’s Work? “The project at Union Square … I’ll call it not merely inefficient, but wildly so. But now, it seems all they do is dig stuff up, patch it back over, dig more stuff up, and move the dirt around the site. Not one place or another permanently, but back and forth. Dirt needs to be here, dirt needs to be there. And then sometimes they’ll load up a truck with dirt and send it away. Not all the dirt, mind you, just the right amount. Other times, they’ll order another truck back to the site, hauling different dirt, and add it to the growing, moving-target piles. What’s irking me today is the constant waste. Everyday, this guy’s morning job is to water the dirt. And then we all watch as that precious summer water evaporates in the hot sun. I understand why they wouldn’t want to work in a dust bowl, but is it really necessary to Wet the dirt, only to see it Not Wet five minutes later? Jessica writes about her observations on random life things on her blog, amidst watching the construction at Union Square Park, and sometimes reporting on that. She’s been a great source for documenting the very tragic tree destruction from her window across from the park. **I haven’t written about the anonymous donation ($7 Million!) towards the restaurant at Union Square Park in awhile and it’s been fairly quiet overall. More about that here. Community Improvement Districts (CIDs) to counteract the far-reaching Business Improvement Districts(BIDS)! It seems every district in New York City has a Business Improvement District, breezily referred to as BIDS. On the face of it, businesses wanting to improve their districts … it sounds so benign, right? But as artist and activist Robert Lederman outlined in a previous entry “Parks for Sale: Business Improvement Districts and the Privatization of our Public Spaces,” the BIDS don’t just stay on their side of the street. In Mayor Bloomberg’s New York, their tentacles spread far and wide, amidst the roots of the trees, up through the dirt or concrete, and busting out into our public spaces. A new model, Community Improvement Districts(CIDS), works to protect, preserve and promote the well being of the community. The needs of the people are the primary concern, distinguishing the CIDS from the better known and financed groups known as BIDS, whose sole interest is to promote better business and an environment conducive to shopping. At Union Square Park, the local BID, Union Square Partnership (co-chaired by restauranteur Danny Meyer), runs all the activities in the Park from clean-up to yoga! A significant down side is that they have unrestrained control over what happens at this public space (including cracking down on artists and free speech). Their latest plans to place a restaurant within the historic Pavilion have been met with community disapproval and outrage. It was design plans they initiated that led to fourteen old trees being chopped down for no reason, other than they were in the way of the design. (Apparently the idea of working them into the design was not considered). And our NYC Parks Department, under the aegis of Mayor Bloomberg, supports this, and further privatization of our parks. At Washington Square Park, the local BIDS(who have prominent positions on local Community Board 2), along with NYU and the Tisch Family, and with full support and implementation by Mayor Bloomberg and his Parks Department, have played a role in a redesign plan that is destroying the very heart of this beloved and historic Park. The BIDS’ role in our communities needs to be lessened, not enlarged. The BIDS need to stay out of decision-making related to our public spaces. We need transparency and democracy. What we have in our city parks and public spaces is considerably removed from that at the moment. The Community Improvement District model works to change that and, instead of the well-being of Danny Meyer or NYU or Barnes & Noble, places the well-being of the community first.